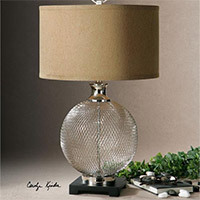 Accent lamps are more about creating a visual interest in the room rather than illuminating the space. We are accent lighting experts and ensure you get the finest selection of accent lighting solutions. We present an interesting range of accent lamps, very different from what you might expect—from vintage to contemporary themed lamps to those that are outright outlandish and some gorgeous lamps with intricate designs, we give you the biggest online inventory of Accent Lamps. Whether you need to create contrasting points of darkness or illumination in the room or highlight valuable sculptures or showpieces, these accent lamps are the perfect addition to your recipe for making the home décor look exclusively beautiful. Our lamps are built with an emphasis on aesthetic sensibility. From highlighting the texture of your walls to creating a warm, cozy glow around a couch, these accent lamps will never fail you. Accent Lamp There are 81 products.